This is the free weekly edition. 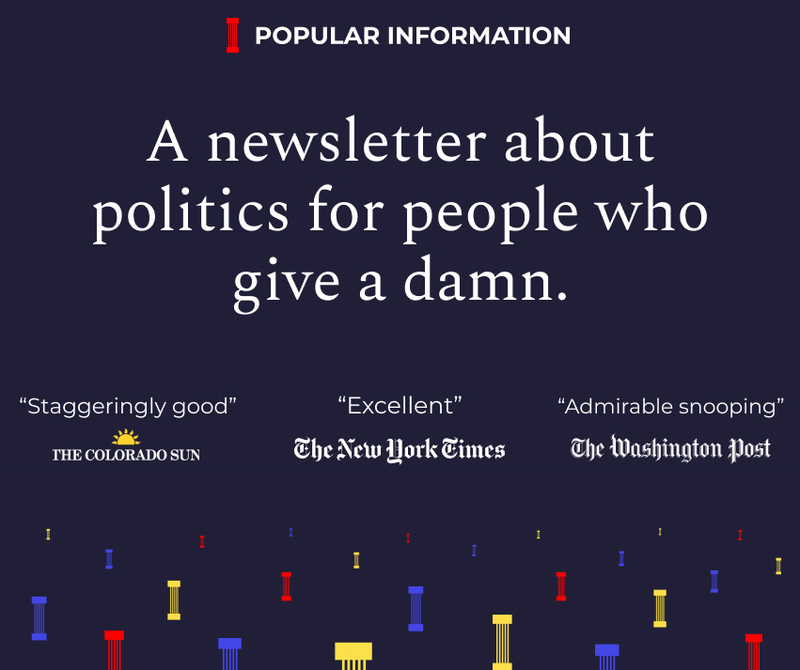 To receive Popular Information four days a week,subscribe for $6 per month or $50 for an entire year. As a candidate for president, Donald Trump promised, in an interview with Bob Woodward, that he would eliminate the debt within eight years. TRUMP: Well, I would say over a period of eight years. This, of course, was a ludicrous pledge. It would involve not only balancing the budget, something that hasn't happened since 2001, but also running up massive multi-trillion dollar surpluses each year. As president, Trump has rapidly gone in the other direction. With Republicans in control of Congress, Trump increased the deficit from $587 billion in 2016 to $665 billion in 2017 and $779 billion in the current fiscal year. Things get worse from here. The Congressional Budget Office projects that annual deficits will average $1.2 trillion over the next ten years. But now, Republicans are not in complete control of the federal government. The Democrats took back the House of Representatives and Congresswoman Nancy Pelosi (D-CA) is expected to become the next House Speaker. Pelosi has pledged to reinstate the "pay-as-you-go" rule, commonly known as pay-go. Under pay-go, any policy that increases the deficit must be offset by tax increases or spending cuts. "We all have responsibility for reducing the debt for our children. Democrats believe that you must pay as you go. Whatever you want to invest in, you must offset," Pelosi said at a forum hosted by the Peter G. Peterson Foundation, an organization dedicated to reducing the debt. Pelosi's plan threatens to create a dangerous asymmetry in American politics. When Republicans are in power, they pass whatever policies they want, regardless of the impact on the budget. But now that Democrats can pass legislation again, they may limit themselves to policies that can be offset by raising taxes or slashing spending. One of the big new drivers of the deficit are the corporate and individual tax cuts passed by Republicans in December 2017. Those tax cuts are expected to add $1 trillion to the debt over the next decade. Democrats were so committed to pay-go under Obama that they made it a federal law. When Democrats passed Obamacare in 2010, every cent of additional spending was offset by spending cuts and tax increases -- and then some. It reduced the deficit. So how did Republicans pass a massive tax cut without doing anything to offset the costs? They just paired the cuts with a waiver of the pay-go rules. Problem solved. The deficit in the last fiscal year can be explained entirely by Republican policies enacted since 2001. A report by the minority staff of the Senate Budget Committee found that the combined cost of the Bush tax cuts ($488 billion), the Trump tax cuts ($164 billion), the wars in Afghanistan and Iraq ($127 billion), and defense spending increases above Clinton-era levels ($156 billion) exceeded the federal deficit of $779 billion. Without these Republican policies, the government would have had a surplus of $156 billion in 2018. Today, the total size of the federal debt is about 80% of the U.S. economy. Without the Republican policies enacted since 2001, it would be around 30% and on a downward trajectory. Pelosi's position is rooted in the politics of the 1990s when positioning the party as fiscally responsible was considered a top priority. But some Democrats are objecting to Pelosi's plan to reinstate pay-go now. New members are advocating bold ideas to improve health care, reduce the cost of college and tackle climate change. A pay-go rule could make passing these policies through the House close to impossible. "The pay-go thing is an absurd idea now given the times and given what’s already been done to curry favor with corporate America," Congressman Raúl Grijalva (D-AZ) said in June. Pelosi, who is still cobbling together the votes she needs to become Speaker, is listening to pay-go critics but has not yet reversed her position. She has agreed to put policies like pay-go up for debate. The broader policy question is whether a focus on reducing the deficit is advisable. The answer is complicated and depends on the circumstances. In the depressed economy that prevailed for years after the financial crisis, government borrowing didn’t drive up interest rates, money creation by the Fed didn’t cause inflation, and nations that tried to slash budget deficits experienced severe recessions. In an economy that is closer to full employment, like the one Trump inherited from Obama, there are downsides. But that isn't to say that reducing deficits is the most important priority or that a failure to reduce deficits would create an economic calamity. Instead, the impact of increased government borrowing on private investment has to be weighed against other priorities. While acknowledging that deficit spending isn't costless, David Leonhardt argues it's "clear that our country has some big problems, more serious than the deficit, that government spending could alleviate: inequality; outdated infrastructure; a shortage of high-quality preschool, K-12 and higher education; a shortage of clean-energy research and subsidies; and so on." There is also a practical consideration. An actual policy of fiscal responsibility would require each political party to exercise it when in power. Democrats unilaterally imposing austerity on themselves won't reduce the deficit. Republicans have shown they are more than willing to squander any savings banked by Democrats on tax cuts and military spending. Hyde-Smith faces a runoff election against Democrat Mike Espy on November 27. A demonstration in protest of her lynching remarks is scheduled to take place in front of her Jackson, Mississippi office on Friday at noon. The protesters are calling on Hyde-Smith to resign or be removed from office. Thanks for reading! Send your feedback to judd@popular.info. Though this post doesn't indicate it, I'll bet that Zieve is not too fond of Jews, African-Americans, etc., etc., either.